Proper food for kids. Nutritionist approved. British beef. 2 of 5 a day. Low salt. No added sugar - contains naturally occurring sugars from fruit & veg. No additives or preservatives. We make our cottage pie with minced British beef in a tomato and veg sauce and top it with potato and veg mash. 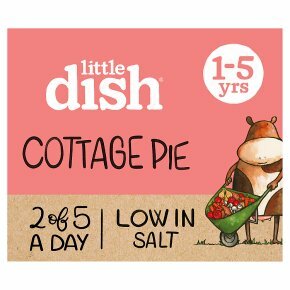 Our Cottage Pie is best cooked in the oven. Please do not reheat. All microwaves vary, these are guidelines only.Always test the temperature before serving. Take off the card sleeve and pierce the film in a few places. Put on a microwaveable plate and cook for 2 mins 30 secs at 900W. Let your pie stand for 1 min and then cook for another 2 mins at 900W. When it's ready, let it rest for 2 mins in the microwave and then peel off the easy peel film and serve. Take off the card sleeve and pierce the film in a few places. Put on a microwaveable plate and cook for 1 min at 900W. Let your pie stand for 1 min and then cook for another 1 min at 900W. When it's ready, let it rest for 2 mins in the microwave and then peel off the easy peel film and serve. Preheat your oven to 190°C (electric), 170°C (fan), Mark 5 (Gas). Take off the card sleeve and easy peel film. Put the pie on a baking tray in the middle of the oven for 30 mins. When it's ready, let it rest and cool down for 2 mins before serving. Preheat your oven to 190°C (electric), 170°C (fan), Mark 5 (Gas). Take off the card sleeve and easy peel film. Put the pie on a baking tray in the middle of the oven for 45 mins. When it's ready, let it rest and cool down for 2 mins before serving.